Whee, it’s not even the end of January and I have another finished project to blog! Look at me go. 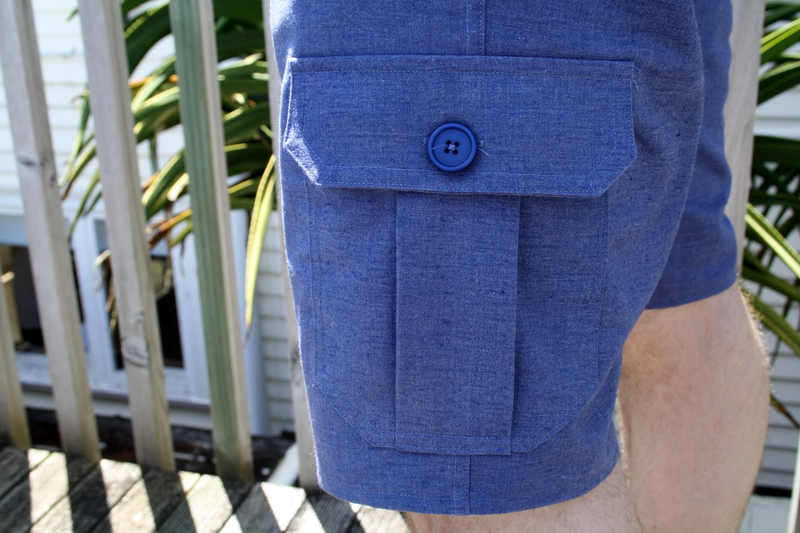 Yes, it’s more sewing for Luke – this time a pair of shorts to go with his new short-sleeved shirt. 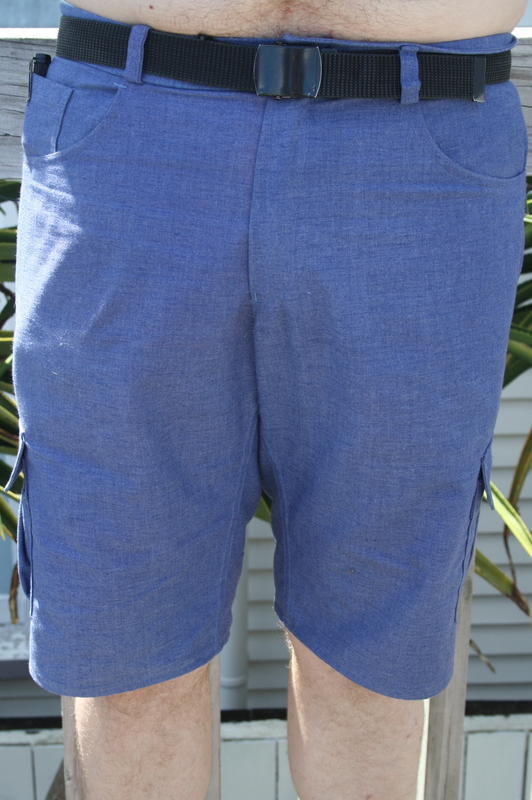 After my failure with the Jedediah shorts, I was neither keen to use a Thread Theory pattern nor make shorts again. But, the weather in Auckland is humid and gross and warm, and Luke walks to work and back and was not digging it in jeans, so I relented. 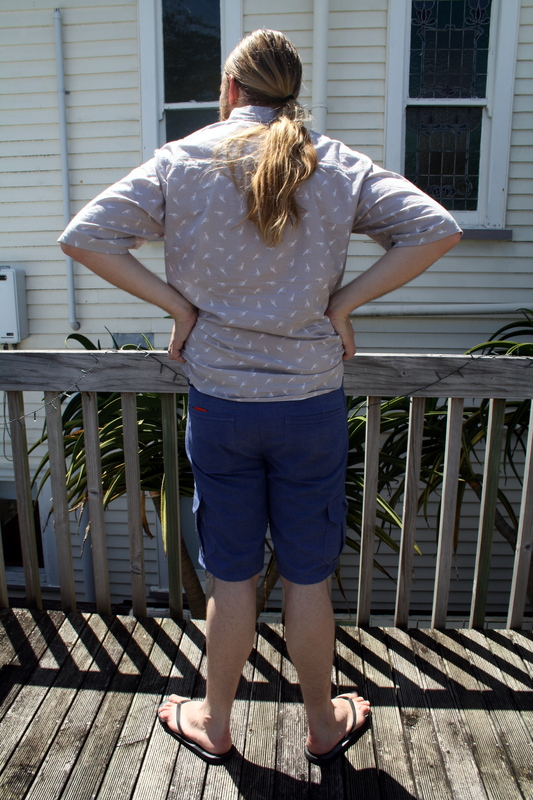 After trying and failing to find a suitable shorts pattern elsewhere, I gave in and bought the Thread Theory Jutland Pants pattern. 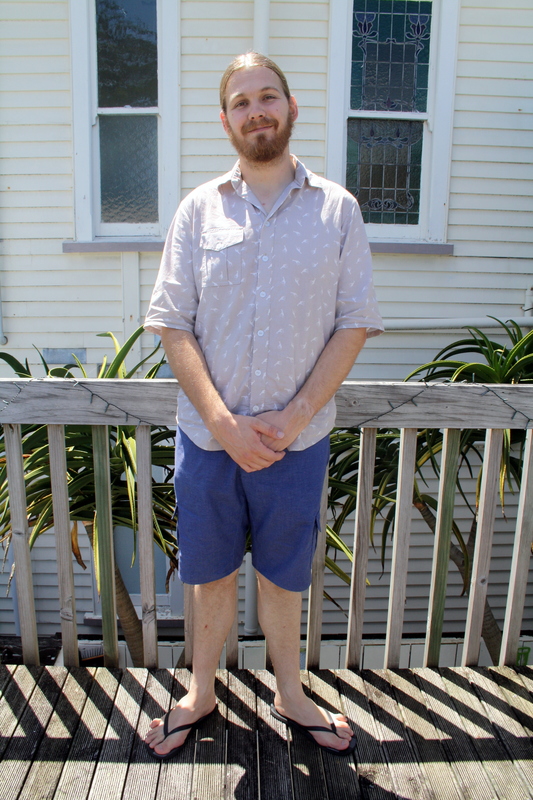 The Jutland Pants are really more up Luke’s alley than the Jedediah – Luke is a no-nonsense, practical kind of guy, and these are no-nonsense, practical pants/shorts. He was especially keen on the cargo pockets! I used the instructions as a vague guide and I think they’re a bit better than the Jedediah ones. Or maybe I’ve just had more practice now. Either way, these weren’t a difficult make, just time consuming with all the topstitching and flat-felled seams. I made a quick and dirty muslin in a size 39, which is what Luke’s measurements put him at. They were MASSIVE on him, and so after pinning and re-measuring, I went down to a 36. In actuality, I think he’s probably a 37, but that size doesn’t exist on the pattern. It’s a bit odd there’s a 3″ difference between the sizes, really. I could have blended between the sizes, but Luke was impatient for shorts and so I didn’t bother. Between that and festive eating, when Luke tried on the finished shorts, they fit…just. With a helping of muffins over the side. No matter though, because one of our goals this year is to eat healthily and be more active, and I’m pleased to say that after some effort in that department, they fit him quite well! He does say the pockets are a tiiiny bit snug (and you can see kind of a weird fold where the pocket meets the side seam where the pocket lining bunches up if he doesn’t straighten it out), so when I make another pair (because of course he wants another pair) I will make them just a tad larger through the hips. The Jutland Pants don’t have any indication of where to cut them off for shorts (that I could see) so Luke indicated to me where he wanted them to sit, and we did it that way. I then carefully moved the cargo pocket markings up the requisite amount to fit them onto the shorts – I could not find anyone else in the sewing blogging world who had done the shorts with the cargo pockets, and believe me I tried, so I was a bit worried maybe it couldn’t be done for some reason, but they turned out great! They look uneven in the photo above, but they’re not – it’s just the way Luke was standing/the way the shorts are sitting with his belt. I did patch pockets on the back, and somehow fudged up the instructions for sewing, folding and turning with the tops of them, but I actually like the way they turned out – a design feature, if you will 😉 He declined any kind of decorative stitching on the pockets. All the seams are flat felled except the crotch seam, which is double stitched and then bound with store-bought grey bias binding, and the waistband, which is finished the way I like it – seam allowance folded in and stitched in the ditch to secure. One thing Luke requested was a coin pocket. It was pretty easy to make one – I just measured one on his existing jeans, added seam allowance, positioned it and sewed it on. Done. He wanted it deep enough to put his flashlight in (as seen above), so I added a little bit of depth to it to accommodate that. The inside of the pockets is just plain calico – Luke rejected all offerings of even slightly whimsical fabric from my stash. 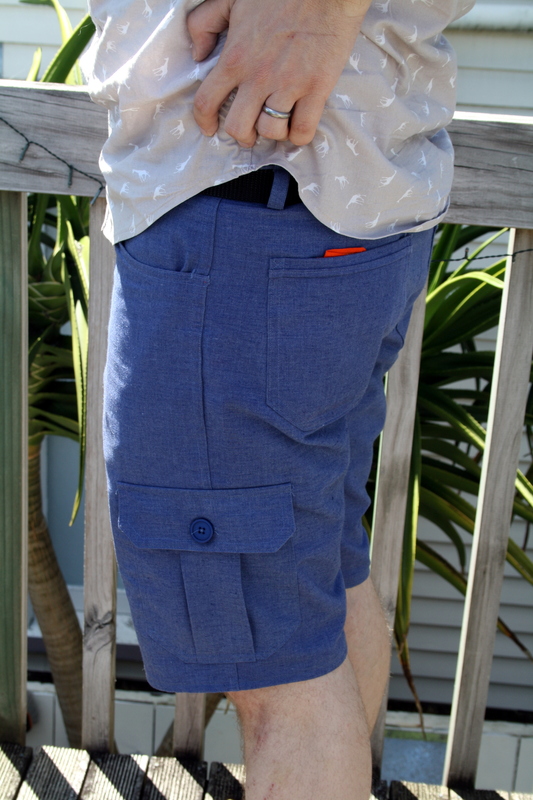 I’m pretty proud of the cargo pockets – I think they look pretty good! Luke chose the buttons from Masco Wools. The fabric for the shorts came from my local Red Cross op shop – they often have a basket out the front of fabric, and all lengths are $3. I brought home 5m of this blue drill fabric, so there’s enough to make some shorts for me if I so desire. Not bad for $3! It’s the perfect weight for these shorts. Zip came from my massive bag of zips from the Salvation Army I scored last year. All in all, a cheap, successful make! Thanks Maria 🙂 I’m sure your husband will be pleased if you make him something this year! very classy looking and well made, you must be pleased. My Jedediah shorts were too big the first time around, but I think it was the fabric – loose weave, and it stretched out. I do prefer the Jutland ones, they suit Luke so much more and the pockets are indeed practical 🙂 I look forward to seeing your version if you make some! I had the same problem with my first pair of Jutland shorts; the inner pocket was buckling. Because my man’s measurements suggested I grade down a size in the hips, I figured the size differential would take care of itself. Since it didn’t, however, I came up with another solution: I extended the front leg piece (pattern piece # 1) at the pocket out 5/8” but left the pocket bag and back leg piece (#s 2 and 8) the same. 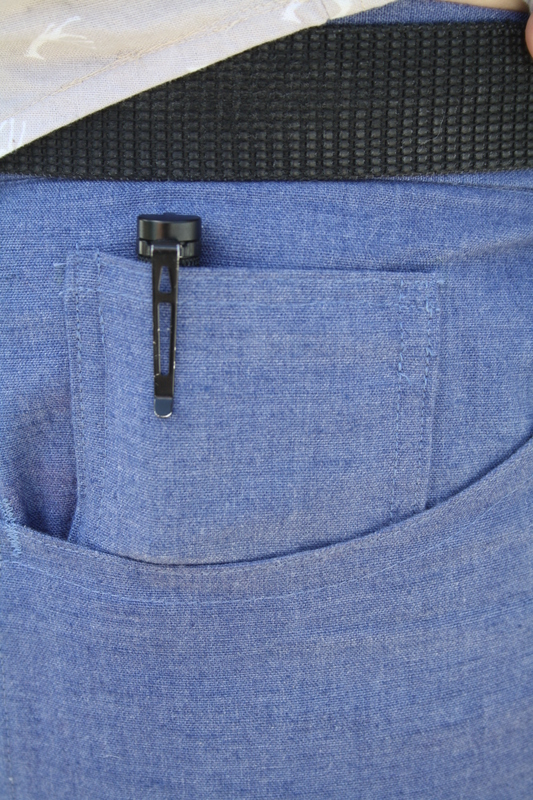 I tapered from the front pocket curve [that I extended 5/8”] to the hip. The second pair came out perfect. Aha! Very clever solutions, thanks so much for this. I will try this out on my next pair.